Your headlights are necessary to drive safely at night, but aren’t all headlight bulbs the same? Not exactly. Headlight bulbs vary drastically in quality, and you may have a hard time finding the right headlight bulbs for your needs. In this article, we’ll take a deep dive into five of the best halogen headlight bulbs on the market today so that you will have a good feel for the landscape. By the time we’re done, you’ll know exactly what to look for when you’re purchasing a halogen headlight bulb, and you’ll also know what to avoid. How Long Should A Halogen Headlight Bulb Last? Which Headlight Bulbs Protect Me From The Most Hazards? How Do I Avoid Damaging My Headlights While Installing Them? Are All Halogen Headlights Compatible With All Cars? Now that you’re acquainted with a few of the best headlight bulbs on the market, it’s time to discuss the features that you will need to find when you look for a new bulb to fit into your car. First, your headlight bulb needs to be bright enough. This seems obvious, but many headlight bulbs are simply not powerful enough to fulfill their intended purpose beyond what is legally mandated. The brightness of the bulb depends on your intended applications. If you plan on driving around mostly in the city or suburbs, getting a super-powerful and super-bright light with long range will not serve you well. The light will be blinding to other drivers, and it will scatter off of all of the surrounding surfaces to create a lot of glare even if the environmental conditions are acceptable. On the other hand, if you intend on driving around rural areas with no street lamps, you will need the brightness on your side to help you avoid hazards like animals that may be standing in the middle of the road. The whiteness of your lights is also a critical factor. Many car enthusiasts spend a lot of time trying to find the headlights that provide the purest white glow. The whiteness is more than a status symbol, however. White lights provide a view of what is in front of you that is more accurate than yellow lights or lights of other colors. They also tend to take up more energy from your car and burn out faster. For the most part, you will be better served by lights which are closer to white than they are too yellow. Unless you’re a stickler for only using the most fashionable products, you won’t need to opt for the absolute whitest bulbs, however. Pick out a bulb that is mostly white, and go from there. Furthermore, the aesthetic quality of your headlights is not a negligible factor. You want your car to look good during the day and also during the night. Most headlights are of similar build, so you will find it easy to blend in with most headlight choices. If you would prefer that your car stands out, finding the right pair of headlights can be somewhat difficult. Many headlights offer trims which are tinted and reflective such that when light reflects off of them during the day, there is a tiny halo of color. You will find it hard to do much better than this unless you are willing to spend a lot more money on finding an aesthetically pleasing bulb. Opt for blending in rather than picking something that stands out and looks ugly. Finally, you’ll want your headlights to last for a long time. There’s nothing more frustrating than realizing that one of your headlights has gone out well before its rated lifetime. There isn’t a standard lifetime for headlights in the way that there are standards for shape, size, and brightness. This means that headlights vary drastically in their lifetimes regardless of use. Picking a quality headlight — and often, an underpowered headlight — is the surest way to guarantee that you won’t need to replace the bulb every few months. 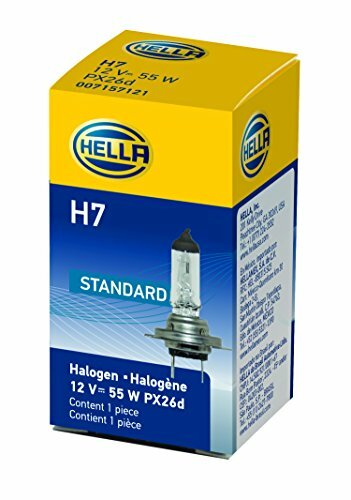 The HELLA H7 Standard Halogen Bulb, 12 V, 55W is a bright, pleasant, and durable halogen headlight bulb which you can rely on for thousands of hours of light. The HELLA H7 halogen bulb is the most basic headlight bulb which will serve most people effectively. The H7 is easy to install, very inexpensive, and comes with a good instruction set to help you along the way. Furthermore, the H7 is bright, has a long life, and also has many variants which you can purchase to extend the lifetime or brightness even more. Most people won’t need to use these variants to get the most out of these headlights. You will find that installing the H7 is quick and easy with the help of the instruction set. While The low price of these bulbs may throw you off, you can rest assured that they are of high quality owing to their standardized build. 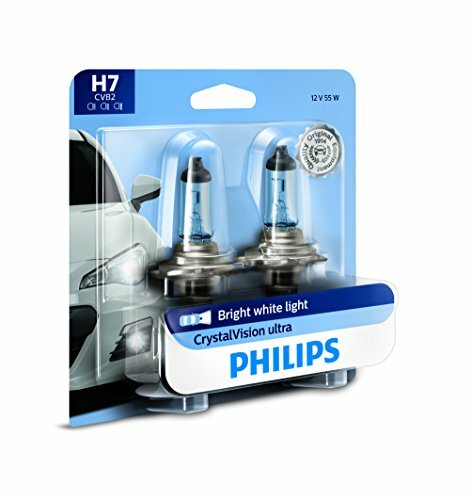 The Philips H7 CrystalVision Ultra Upgraded Bright White Headlight Bulb is the whitest colored bulb that you can purchase using halogen. This Philips bulb advertises that it is “xenon-like” owing to its spectacularly white light. While the bulb itself still uses halogen, you will indeed find that the whiteness of the light is nearly unbeatable in other halogen lights. These lights also have a bit of aesthetic flair, too. The blue trim on the edge of the light gives a nice reflective look to the bulb if viewed from a certain angle during the daytime. You can use these bulbs in a handful of different applications, ranging from high beams to front fog lights. Standard low-beam functionality is a given, of course. While these bulbs aren’t specifically adapted to any particular weather condition or car type, you’ll find that they work effectively in most niches. If you’re looking for a specialist bulb for a very demanding environment, you might want to keep looking, however. 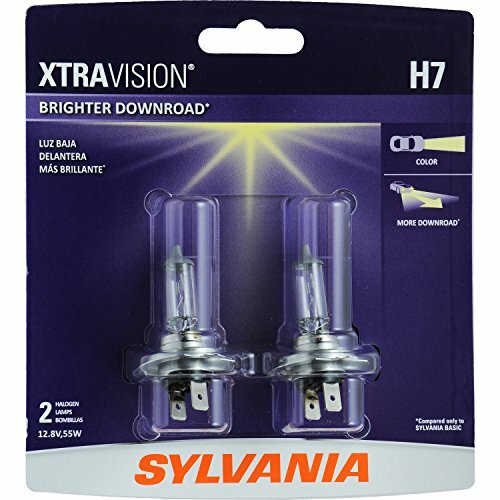 The SYLVANIA H7 XtraVision Halogen Headlight Bulb is a bulb that is optimized for long-ranges. Sylvania is a popular name in the halogen headlight bulb field thanks to their reputation for producing long-range and high quality lights. These lights are no exception. You should get a few more feet of light out of these bulbs than you would with an equivalent competitor bulb. You may not always notice the difference, but, in extremely dark conditions in rural areas, you will appreciate the extra vision which these bulbs provide. These bulbs aren’t the most durable, however. Their lifetimes tend to be slightly shorter than other equivalent brightness bulbs. Likewise, you may find that there is slightly more glare with these bulbs than you would find with equivalent bulbs. The glare is a consequence of the added range of the bulb. There isn’t much you can do about it, but it shouldn’t be too troublesome to deal with. Especially in swampy areas, the glare is an annoyance but not a dealbreaker. 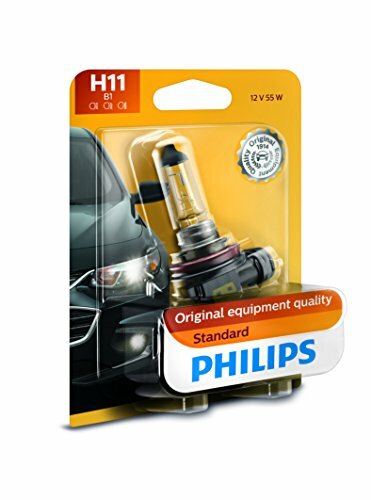 The Philips 12362B1 H11 Standard Halogen Replacement Headlight Bulb is a simple but effective bulb set which brings all the strengths of a halogen light to your car headlights. The Philips 12362B1 isn’t the most technological headlight out there. Most of the technology in this bulb is the same as it would have been 40 years ago. Because these bulbs are tried and tested, they have abnormally high durability and length of life. You may not get the most outlandish features from these bulbs, but you will find that they last a very long time no matter how much you use them. Like other Philips offerings, these bulbs also come with an excellent instruction set which you will appreciate. Installing these bulbs is relatively painless, and they’re broadly compatible with any car you could imagine. If you’re looking for the most standard and highest quality headlight bulb using halogen, this bulb set will be the right one for you. 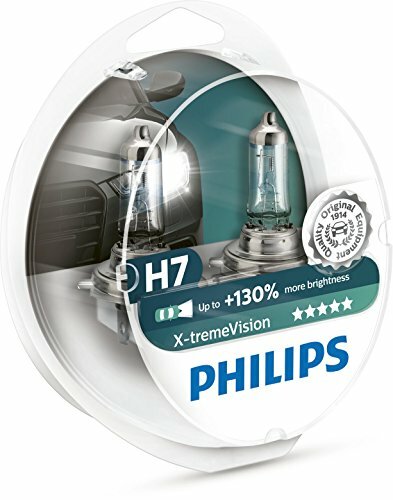 The Philips X-treme Vision +130% Headlight Bulbs are a high-end headlight bulb offering which will startle you with its brilliance and whiteness. The X-treme Vision is one of the brightest and also one of the whitest long-range headlight bulbs on the market. This bulb has it all: whiteness, range, width, and sheer brightness. If you are looking for a high-end headlight bulb using halogen, this is the right bulb. The bulb has a range that is up to 147 feet longer than other bulbs of the same size. This is a very large difference! Most other “long range” headlight bulbs only offer a dozen feet or so. You will be able to tell that you are using these powerful bulbs the first time you go for a night drive. The brightness and the range of the bulbs are not to be ignored, but the other remarkable feature of these bulbs are the whiteness. The whiteness of the bulb is noticeable from a long way away, and the purity of the color screams quality to anyone who sees them. You’ll also have a much easier time with night photography using your headlights as your light source as a result. Most bulbs have an expected lifetime duration written on the box. You can expect these lifetimes to be accurate to within about 25% of the listed number, which is to say that the estimates written on the boxes are fairly poor. Nonetheless, there is such a great range of advertised lifetimes of headlights on the market that you can easily pick out the headlights which will last the longest. Find the headlight with the highest listed number, and you should be all set. Most halogen bulbs are equivalent at protecting you from different hazards, but there are a few exceptions. Bulbs which have narrower fields of light may seem undesirable because they light up a smaller area in front of you, but these lights are more effective against fog than others. Likewise, lights which are extremely wide in their coverage may be the best for areas where there are likely to be animals or people jumping out from the sides of the road in an attempt to cross at the wrong time. The added field of view will help you see them and steer away. There are a few halogen bulbs marketed specifically for their effectiveness as high beams, but these are mostly to minimize the hazard of other drivers. You should still be able to switch these bulbs from high-beams to normal beams, which makes them average at mitigating other hazards too. Most headlights have an instruction set which will help you install them safely. The standard wisdom is to avoid touching your headlight with your hands or anything that is dirty. Use nitrile gloves or paper towels to gently handle the headlight before installation. Between these two methods, the gloves are preferable — and inexpensive — because they let you maintain your dexterity while installing the bulb. Most halogen headlights are compatible with most cars, but it is not a rule that they will be compatible. You need to check the threading of the bulb. Then, check the threading of the socket in your car. This should be listed in your car’s manual or on the internet.